Just like half the country’s population I was raised in a vegetarian household. I remember I was 13 when my mother first allowed me to cook some poultry. I was given strict instructions to not touch any of her kitchen equipment with chicken-soiled hands. She even bought me a special vessel and everything to keep her kitchen pure. I had no idea how long it takes to cook chicken, nor did my mom. I assumed it would take forever if I used an open vessel so I used a pressure cooker. It is no surprise, that it was a recipe for disaster. That’s what happens when you aren’t familiar with the ingredient you’re dealing with. In cooking school I learnt, look, smell, feel, taste before you cook, and I am going to include read up before you cook to that list. Write this in stone if the ingredient you are dealing with is Bombay Duck also known as Bombil. I think the fresh ones look a little creepy, and so I was Bombay duck virgin until I picked up some courage and bought them at the market a couple of days ago. They are silver-white, slimy lizardfish found in abundance between Mumbai and the Kutch area, in the Arabian Sea. It is also found in the Bay of Bengal and parts of South China Sea. It gets its name from Bombay because it is found here in abundance and from ‘dak’ meaning mail. The story behind this name is uncertain but it has to do with the stinky smell the Bombay Mail train carried during the monsoon. Due to its unique, delicate, melt-in-the-mouth flesh, Bombay Duck has NO substitute. The essence of this fish lies in its delicate texture. The delicate texture of Bombay duck makes handling and cooking this fish a tad tricky. It stinks when dried and has a peculiar smell even when it’s fresh. The bone structure of this fish fairly simple, it has a single, soft bone running through its back. Bombay Duck is often sold dried. It is salted and hung on ropes to dry. In Mumbai, I have spotted fishermen and women salting and drying this fish in Versova and Madh Island, close to where I live. Dried Bombil emits a strong stinky smell and is transported in airtight containers. This dried fish can be used in Curry or a seasoning and flavouring, it is also used to make pickles such as the Bombil paraa. Fresh Bombay Duck on the other hand is very delicate and the flesh is highly perishable. A single fish varies in size between 6 to 12 inches. Fresh Bombay Duck is usually deep fried and is a delicacy along the Western coastal line and the Bay of Bengal. Since this is a highly perishable fish, large quantities are salted and dried. The dried fish is used to season and flavour curries and rice. 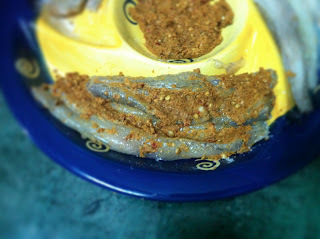 Dried Bombay Duck is also used to make pickles. 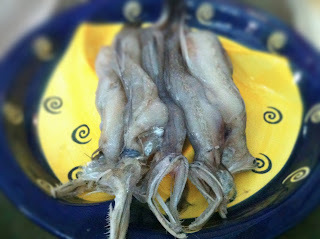 Fresh Bombay Duck deep-fried is a delicacy. With a crunchy coating it literally melts-in-the-mouth. In a Bengali preparation, cooked disintegrated fish is mixed with flour and spices and made into fritters, where as along the west coast the fish is fried in one piece. Curries or any wet cooking method can cause the flesh to break easily, so will pan-frying due to handling. 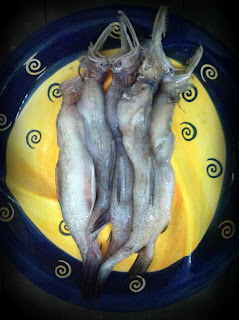 Fresh Bombay Duck should be silvery-white with a slimy glossy skin (no scales). The flesh is pinkish on the inside. The body should not be saggy or swollen. The flesh should not have darkened or broken but intact. Although this fish does have a powerful smell, when fresh it should not stink. It should be cooked as soon as possible after it’s bought. If you must, store it covered in ice. Dried fish can keep for up to 6 months in an airtight container. Be careful when handling Bombay duck, it has sharp teeth and a wide-open mouth you may bruise your fingers. The skin is very thin and slimy. First, thoroughly wash the fish and then pat it dry. Cut the head and the tail off. Cut the fins with scissors. Clean the gut with your fingers if necessary. Run the knife along the back to cut open the fish. The bone is exposed but removing it at this stage will make it more difficult to handle. There is a single soft bone running along its body and it can be chewed easily. Once it is cooked, it can also be pulled out simply after taking your first bite to expose the bone. Rub salt on the fresh fish, then wrap it up in an absorbent cloth and put it under a heavy weight for 2 hours. Pat dry each fish before using. Spicy deep-fried Bombil with a crispy semolina crust and a melt-in-the-mouth flesh is a delicacy one must try on a trip to Mumbai, or if you happen to get your hands on it elsewhere, cook it and enjoy! 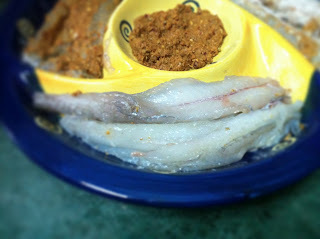 Clean, process and prepare the Bombay duck following the method mentioned above. Pat-dry all the pieces of fish. Grind ginger, garlic, red chili, coriander seeds, tamarind paste and salt with a little oil into a smooth paste. Rub this paste on the fish. 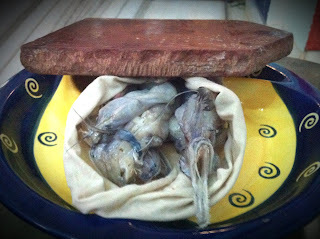 The paste can also be stuffed along where the slit is made on the body of the fish. In a plate, mix rice flour, semolina and a pinch of salt. Roll the flavoured pieces of fish in this semolina-rice flour mix. Pat and remove the excess flour clinging on to the fish. Heat oil in a deep pan and deep-fry the fish in hot oil. Cook on medium heat till the crust turns golden brown. Turn it on an absorbent paper towel. 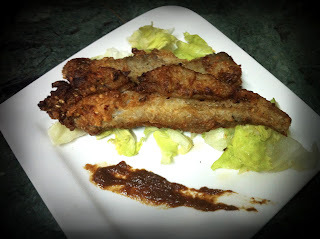 Once the excess oil is removed serve the fried Bombay duck with tamarind paste. Note: Since salt is added in 3 stages in this recipe, be sure to add a limited quantity each time to prevent the fried fish from becoming salty. The fish market is the only website where you can order Seafood Online. The Dry Fish will be shipped from Karnataka through India Post. The Fish Market covered prawns, seafood, dry seafood Online, Sea Food, the seafood markets, Sea Food markets Online, Buy Dry Fish Online, buy dried fish online, dried fish, Sea Food Online, Dry Fish, Buy Dry Fish. Mastering the Art of Cooking With Tea.